An international team of researchers consisting of scientists from NUST MISIS and TU Dortmund University has developed a technology to study the behavior of orthopedic implants in laboratory conditions as close as possible to the human body. The technology is notable for its ethics: the research can be carried out in vitro – that is, without involving lab animals. The research article has been published in the Journal of the Mechanical Behavior of Biomedical Materials. Endoprosthetics – replacing damaged joints or bones with a high-tech prosthesis – is a complicated surgery which uses the most advanced metal, ceramic, and polymer materials around. Any implant material undergoes a number of tests, including those for biocompatibility and behavior in mechanically stressful conditions. Since the results of these studies in traditional laboratory settings are quite different from real wear factors, implants are placed in a laboratory animal to check the implant`s behavior inside a living organism. After some time, usually about a year, the implant is removed and the material's biocompatibility and aging are evaluated. Scientists from the NUST MISIS Center for Composite Materials together with their colleagues from TU Dortmund University have developed a technology that allows them to predict the wear of prosthetic materials under mechanical stress in an environment comparable to the real ones the materials are used in. 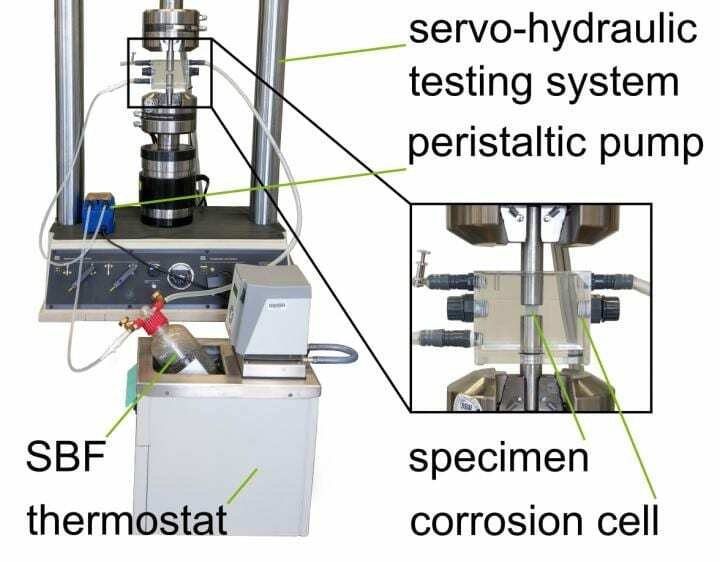 Specially synthesized liquid simulating human blood plasma and a high-tech servo-hydraulic installation have thus completely replaced the need for an experimental live sample. The biomimetic UHMWPE developed by researchers from the NUST MISIS Center for Composite Materials was used as a research material. "We have provided the material and have proposed the use of synthetic plasma, and our colleagues from TU Dortmund University have developed a fatigue testing technology and conducted the experiment on their equipment. The material was subjected to two types of mechanical loads simulating the load of the femur and tibia: cyclic and static. Thanks to this experiment, we have proved that it is possible to predict the behavior of an orthopedic implant in the human body in vitro, without resorting to animal testing", said Fedor Senatov, Candidate of Physical and Mathematical Sciences and research assistant at the NUST MISIS Center of Composite Materials. "Our ambition was to offer an alternative that would reduce the number of animal tests that are ineffective and ethically-questionable in terms of fatigue assessment. The opportunity to propose a new method that would allow researchers to test implant materials for durability in the laboratory [was enticing]. Around the globe, there are still no standards for the study of an implant's fatigue properties in a biomimetic environment associated with high risks of using new materials. We work with tests which allow us to accurately predict the service life of a material. Similar experiments have already been conducted by a research group led by Professor Walter (noted head of the research team from the German side) on metal and ceramic implants. For polymers, this experiment is unique, and has no analogues in the world", said Marina Knyazeva, a representative of the research team from TU Dortmund University. The economy of time is another significant advantage of the proposed technology. If the assessment of an implant's chemical aging in a living organism takes about a year, the durability tests require decades. The process of chemical aging and wear can be significantly accelerated in conditions of in vitro. If the wear indicators are unsatisfactory, this will be immediately apparent and it will be possible to continue experiments with other samples. However, it is too early to talk about the complete abandonment of the role of lab animals in testing materials for prosthetics. "Our technology will allow us to compare several materials without testing any of them on animals. However, when the most optimal material from the list is found, it will need to be tested in vivo in living organisms. This is primarily due to the need to check the biocompatibility of the material, as well as its orthopedic parameters – because patients can meet a variety of features of the musculoskeletal system", explained Fedor Senatov. Thus, scientists have proposed a comprehensive technology for studying of behavior of implants where experiments on accelerated aging in vitro will allow them to predict the service life of a potential implant, and subsequent check its biocompatibility in vivo.